Over the years cricket has incorporated into the game a few of the latest technological advances available. There have been some rejections of technology, such as the use of aluminum cricket bats, but generally the ICC have been rightly cautious about making changes to the game that will impact the players and spectators. Here are discussions about a few of the technological innovations that are in cricket or are being discussed about being included. In international cricket, the third umpire has been used to supplement the role of the two umpires on the ground. The third umpire is equally qualified, and sits off the ground with access to TV replays of certain situations (such as disputed catches and boundaries) to advise the central umpires. The umpires out on the field are in communication via wireless technology with the other umpire. The third umpire is also asked to adjudicate on run out decisions, which he uses video replay and makes a decision without consultation with the two central umpires. Cricket has joined some other world sports and have included an umpire referral system in some international matches. Such a system was first trialed in 2008 (in a Test series between Sri Lanka and India). Unlike in tennis where the challenge and referral decision is clear cut using hawke-eye technology, the cricket referral is adjudicated by the third umpire, and is open to further errors. The actual way it works may change and develop, but when it was first brought in this is how it worked. It all sounds great for the players and viewers at home, but the pressure is on the umpires. In reality, the process often takes too long and can distract from the game. When there are challenges left near the end of an innings, players tend to make frivolous challenges on the off-chance of getting a decision overturned. So there are still problems that need to be ironed out, but the referral system is a great step forward for cricket. Hawkeye - A computer system first used in 2001 for showing the path of a cricket ball. It is a commonly used and is an indispensable tool for cricket commentators around the world to confirm the umpires decisions. It is used as part of the DRS for adjudicating LBW decisions. Read more. Snick-o-Meter - a very sensitive microphone located in one of the stumps, which can pick up the sound when the ball nicks the bat. This technology is only used to give television audiences more information and to show if the ball did or did not actually hit the bat. Unfortunately at this stage the umpires do not get the benefit of hearing 'snicko', though a Real-time Snickometer is being developed to supplement Hot Spot technology. Read more. 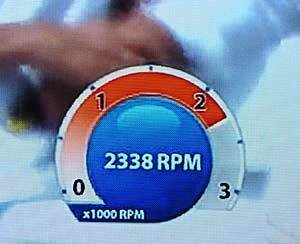 Ball Spin RPM - Starting during the TV coverage by Sky sports for the 2013 Ashes series, they were able to show a RPM (revolutions per minute) counter, showing how fast the ball was spinning after release. It is not clear how this is measured, though it would need a high speed camera focused on the ball, possibly using the same images that are captured for the Hawkeye system. 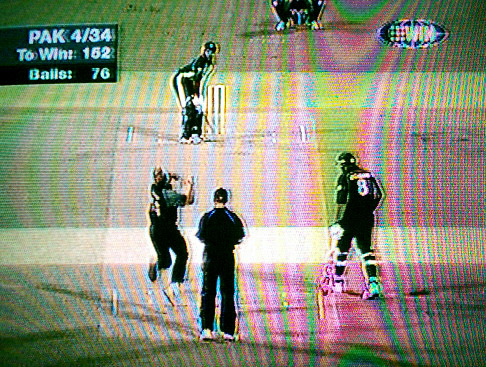 Hot Spot - the hot spot technology is mostly used to review whether the bat has hit the ball, particularly when there is a small nick. If there is contact, the small amount of heat generated is indicated by a change to that area of the bat. Hot Spot uses two infra-red cameras positioned at either end of the ground. These cameras sense and measure heat from friction generated by a collision, such as ball on pad, ball on bat, ball on ground or ball on glove. Using a subtraction technique, a series of black-and-white negative frames is generated into a computer, precisely localizing the ball's point of contact. Following some controversy after the 2012 UK Ashes series, there is doubt over the accuracy of Hot Spot. No Balls at the crease - Give the umpires some feedback about whether a front foot no ball has been made. It would be simple to include some technology which gives the umpire a beeping sound if the bowler crosses the popping crease, like in tennis for let or fault calls. This will mean that the umpire does not need to be distracted and looking down as the bowler delivers the ball, and can focus on what the batsman and fielders are doing. No Balls for chucking - It is difficult to monitor each bowling delivery during a match for bent arm throwing, but new technology is being developed that could possibly be used for such a thing. Previously, any player reported with an illegal bowling action had to undertake 3D biomechanical analysis of their action in a laboratory. New technology using inertial sensors is being developed that could possibly be used to test a bowling action during matches to see if they are bending their arm too much during the bowling delivery. Inertial sensors use similar technology to that used mobile phones. These sensors will be light, cost effective and wearable on the bowler’s arm and most importantly will not hinder bowling performance while still allowing information about the bowling action to be assessed in near real time in both match and training environments. Use of a stump camera to determine close catching decisions. Use of yellow & red cards to suspend players from the game of repeatedly flouting rules. Use of biodegradable paint to colour the infield and outfield.